Installing a ceiling fan is an easy DIY project, provided you follow manufacturer instructions. 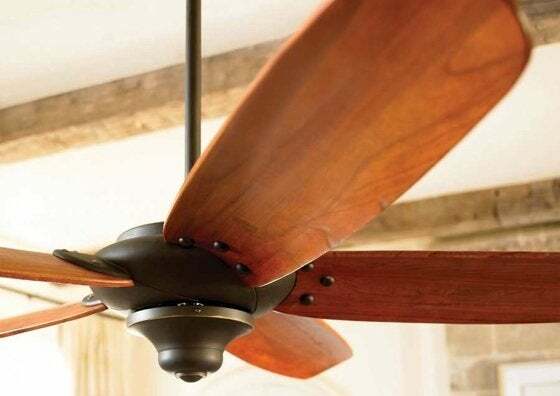 Installing a ceiling fan is a fantastic way to cut energy costs all year round. It helps circulate cool air in the warm summer months, but can also help push heated air back down in the winter, making the temperature feel warmer and allow you to dial down the thermostat. It’s also the perfect weekend project for a homeowner, since you can accomplish the task in a few hours and enjoy the investment immediately. Note: this project is designed for installing a ceiling fan where an overhead light fixture already exists. If additional wiring is necessary to install, consult an electrician. All wiring must follow local codes. When choosing a fan, note the size of your room. The blades need to be at least 18-24″ from all walls, and be a minimum of 7′ from the floor, and 10″ from the ceiling. Choose a 36″ fan if your room is less than 12′ square, 42″ if the room is between 144″ and 256″ square, and 52″ if the room is more than 15×15′ square. Choose a ceiling box approved for fans. Boxes for overhead lights are not strong enough to support the weight. Choose a metal box that can support the weight. If you have access from the attic above you can install the box to additional framing between joists. If not, grab a brace bar at the hardware store. This will screw into the joists, and the ceiling box and fan will hang from the newly added support. Turn off the electricity at the breaker box, then carefully remove the old light fixture and it’s ceiling box with a screwdriver. Make sure the wiring is in good condition and consult an electrician to replace if necessary. Making sure the hole is between two ceiling joists, trace the outline of the ceiling box onto the ceiling and cut out the shape with a keyhole saw. It should be about 5″diameter. 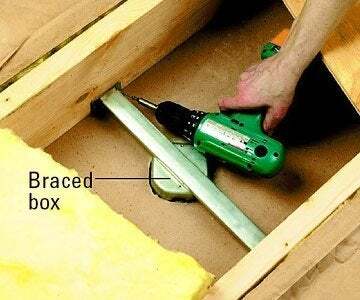 Following the instructions on the brace bar, position it perpendicular to ceiling joists and twist the outer bar until it locks into the foot. Continue turning until the foot is fastened. Next, turn the inner bar to secure the other foot. If you’re not using a brace bar, measure the distance between the ceiling joists, and cut a piece of 2″ × 8″ framing lumber to span the distance, and secure with screws. Carefully pull the wires through the knockout hole in the receptacle box, and attach the fan’s mounting bracket with the hardware included. Attach the fan’s down rod with the ball end towards the ceiling, and secure (usually with an included cotter pin). 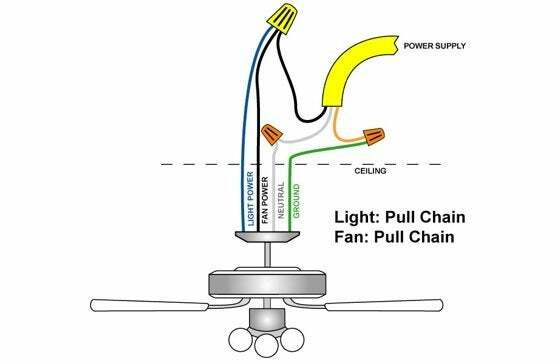 Next, connect the fan’s wires to the circuit wires: white to white, black to black, and the grounding wire to the green lead wire of the fan or a grounding screw. Secure all connections with wire connectors, and tuck into the ceiling box. Attach the canopy or medallion using the screws included. Install the blades using the supplied hardware. Make sure all screws are tightened securely to the blade irons to prevent wobbling. Lastly, if necessary follow the instructions for wiring the lighting kit: white to white, and blue to black. Secure the wires with connectors or electrical tape and tuck the wires into the switch housing. Attach the lighting kit to the fan using the screw supplied. Install any shades and bulbs. Do a final check to make certain everything is secure and turn the power back on at the breaker. Test out the fan. Good job!